The church I attend (Compass Bible Church) produced a 30sec promotional video for our Easter services which we were going to run as a paid ad at our local movie theater. The ad was rejected because it was "too controversial"!! For any of you who have ever gone fishing, perhaps you know the disappointment when you cast your line and wait for hours on end with not even a bite. Maybe you also know the joy of reeling in one fish after another. The same can be true of evangelism - you cast your line and nobody bites. You long to preach the gospel to every creature but it seems that there is not a creature with an ear to hear. 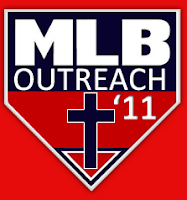 I want to invite you to join me... on Friday April 8th to take part in the 2011 MLB outreach. I will be leading a team to the Petco Park in San Diego where there will be tens of thousands of fans waiting to hear the gospel! Well, they will actually be there to cheer on their favorite hometown team, but we will take advantage of the "fully stocked pond" to get the gospel into the hands of as many people as possible. We will meet at 5pm at the corner of Park Blvd and 10th Ave (the East corner) and will hand out as many gospel tracts as possible before the game starts at 7pm. I have ordered 5,000 MLB gospel tracts that were custom-made for this outreach. Let me know if you are able to join me. If we get enough people I will order more. For those joining us from Orange County, I will be leaving Aliso Viejo at 3:15pm sharp. Let me know if you would like to carpool. Sign up on our Facebook Event Page by clicking here. Here is the video from this weekend's Feet to the Street Evangelism Workshop at Compass Bible Church. Click here if you do not see the embedded video.